Discussion thread for all eight Precure All Stars Movies. Discussion thread for thirteenth Precure Installment! Discussion thread for twelfth Season of Precure Series! Discussion thread for eleventh Season of Precure Series. Discussion for the English Dub of Smile Precure! By Saban. 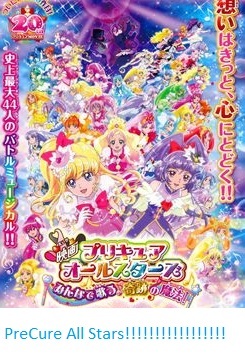 Discussion thread for seventh Season of Precure Series. Discussion for sixth Season of Precure Franchise!